We have made no secret of our views on money market funds. These pools of loans to companies are a major risk to the financial system. Paul Volcker agrees. Earlier this year, the SEC instituted regulations in an attempt to reduce risks for investors. But money market fund managers are still finding ways to put money entrusted to them into risky situations. As MarketWatch reports; “European deposits are the single-biggest part of money-market funds' holdings.” Perhaps we are being a curmudgeon, but we do not want our emergency cash gallivanting around the world. Even ignoring the current Irish situation (Irish bank deposits fleeing and the new Irish government wanting to renegotiate its bailout), Spain and Italy will still have to refinance over $500 Billion early next year. The European debt contagion we forecast last April is ongoing. Why would fund managers want to take this extra risk? To cover their fund expenses, i.e. pay their salaries. Yes, most money market fund investors are merely paying their managers with their returns. Obviously, fund managers are charging excessive fees. (Their compensation has not come down with rates.) For a true cash allocation, U.S. Treasury Bills are still a smarter alternative to maintain wealth. And if something ‘unexpected’ happens, like a European default, they will provide greater liquidity. With the recent rise of the stock market, individual investors are moving back into domestic equity mutual funds. Investor sentiment is hitting 6 year highs. Investors are buying at retail prices, not wholesale. Meanwhile, hedge fund managers are shorting and insiders are selling in record amounts. “He tends to buy on weakness. If a stock he bought advances an eighth, he stops and reconsiders. He says that for him to buy a stock on an uptick is about the equivalent of the Second Coming.” - John Train’s The Money Masters on Warren Buffett. While Warren Buffett would caution us to stand aside, CNBC Fast Money’s Joe Terranova recently blabbered: “the biggest risk is to not be in this market.” Time and time again the herd mentality pulls investors in at tops. It only takes one year of stock losses to equal 7 years of cost of living increases. We prefer to be slow and patient, as fast money is usually money that is leaving. In our report two years ago “How a Recession Turns Into a Depression,” we presented a chart of Japanese real estate prices. 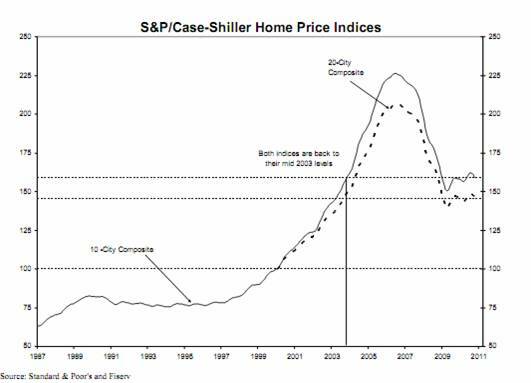 After a burst bubble in 1991, prices continued down for 16 years. It appears U.S. home prices have also turned down again in May and that the tax credit bounce was merely a breather. Nouriel Roubini expects “home prices to continue their decline” as foreclosures increase next year. “…if home prices continue on this pace, down, I think the economy has serious reasons to worry.” – Robert Shiller. Because assets are currently overvalued, we are bearish. But we are not preparing for the apocalypse, like some in the entertainment industry. While we encourage preparedness, modern conveniences are not going to disappear. Quite the contrary, we currently have an oversupply of goods. Simply put, without debt people can’t afford things. Price rises during times with high debt levels are short lived. These increases hurt the ability of the financially stretched to pay their debts. Debt is the problem. In April 2008, we quoted Edward Chancellor (author of Devil Take the Hindmost) who described how the boom of the 1820s ended: “speculation flared up in commodities…the anticipation of exports to liberated countries provoked fears of raw material shortages.” Shortly after, a “torrent of distrust” enveloped credit markets, and fickle Fortune had left. In 1826, stocks were down 80%, while some ‘went unquoted.’” In mid-2008, commodity rises did herald the coming credit crisis. We would like to note that this year’s investment outperformer is indeed input costs. We would not rule out a final spike in commodities early in 2011 before another credit crunch ensues, though it is not necessary.